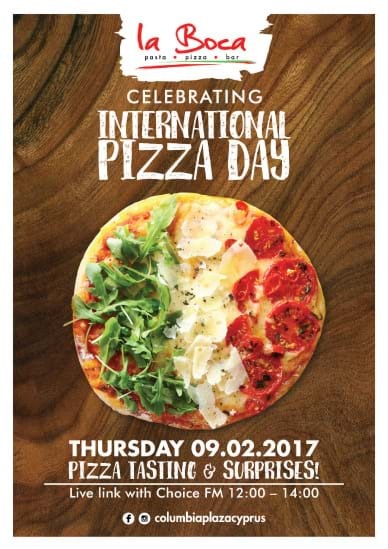 It's International Pizza Day! This February on the 9th, we celebrate 'International Pizza Day' at La Boca with some pizza giveaways, surprises and Live Link entertainment from Choice FM. For the whole of this week, we will be surprising some of our customers who order pizza by giving them their pizza for free! One lucky customer will be chosen each day. For the big celebrations on the 9th of February, customers can enjoy listening to Choice FM as they air their 12:00-14:00 show from La Boca. Enjoy free pizza tastings of new recipes and have a lunch time with a difference! The fun & pizza tasting will continue throughout the day so stop by any time. Happy Pizza Day! For more info follow us on Facebook or call 25 278020.